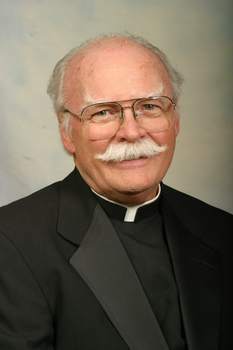 On January 19, 2013, Holy Ground lost a dear friend, Fr. Art Obin, OMI, who from its early days, served as Parochial Advisor for our program. Fr. Art was instrumental in the founding of Holy Ground Shelter. He guided and inspired this group from the first day. He generously provided us with a place to meet, devoted hours listening to us during our every-two-week meetings and interrupting only to give counsel when we were going down the wrong path. Fr. Art was crystal clear about his mission in life…he was about the business of God, about bringing the Good News to those who were poor, to those who were oppressed, to those who were homeless, or without clothing and food. His mission was to lift them up and he constantly challenged those around him to do the same. His passion for helping others was his life’s work and we are so grateful for his commitment and compassion to this mission. He taught us to love unconditionally, to be non-judgmental, to always remember where our young mothers had come from and where they, and their children, could go with a little help from us. He taught us about hope and about holiness. Thank you, Fr. Art, for who you were and for whom you called all of us to be. We pledge to never forget you and to honor your memory by continuing to carrying on your legacy of love.